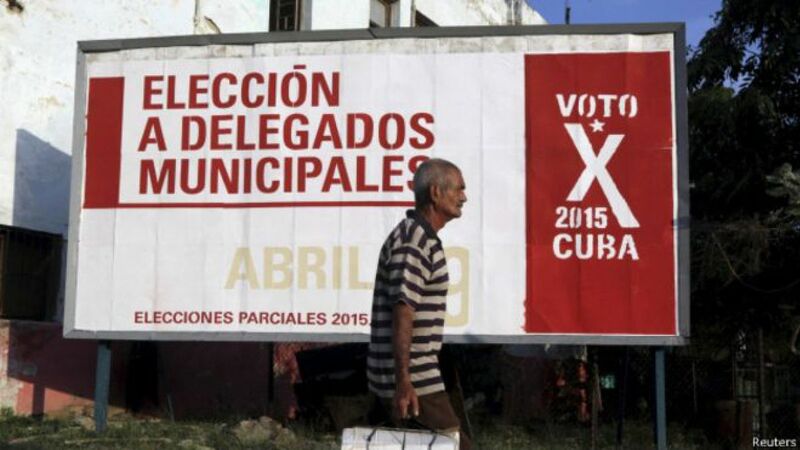 THE most interesting thing about Cuba’s municipal elections on April 19th was not who won. It was who lost, and who did not even turn up. Four months after a historic rapprochement between Cuba and the United States, for the first time two openly declared dissidents made it onto the ballot among more than 27,000 candidates competing for 12,589 municipal posts around the country. Predictably, they were defeated. But their participation was an unusually open act of defiance, not just by the two men but also by ordinary citizens who proposed them in a show of hands before the elections. What is more, the turnout on voting day fell by almost six percentage points compared with the previous poll in 2012, to about 88%. Some claimed rising absenteeism was a crack in monolithic support for the Communist Party. The opposition candidates, Hildebrando Chaviano, a lawyer and journalist, and Yuniel López, a member of the unauthorised Independent and Democratic Cuba party, were labelled as “counter-revolutionaries” in official publicity. On his party’s website, Mr López claims that voters were pressured not to vote for him. Yet both candidates quickly conceded defeat. “The vote was clean. The people don’t want change. They still want revolution,” Mr Chaviano said. The elections have an air of futility about them. The winning candidates are rewarded with a thankless job. They face a barrage of complaints from residents about crumbling housing and poor public services, without having the power or money to do much about them. But voters know that if they do not show up, it is likely to count against them—in university applications, for instance. Such dissidence comes at a delicate time for Raúl Castro, Cuba’s president. In September huge crowds will gather for the visit of Pope Francis, whose office helped arrange the thaw in relations with the United States. This could further heighten expectations of change. Yet the Castro government may also feel that elections can be a useful outlet—so long as the ruling party continues to win. Eusebio Mujal-Leon, of Georgetown University in Washington, says it may be learning a warped version of democracy from its socialist ally in Venezuela, convincing itself that it can remain an autocracy while using elections to stay in power. The road ahead for Cuba’s nascent opposition is not an easy one.